Update: I don't have the time to continue working on this due to various real life things going on. If you're interested in taking over the project please pm me. In the meantime, if this addon stops working for you there is another similar one you can find here: http://www.curse.com/ws-addons/wildstar/223084-housing-repair-alerts. If things change in the future, I'll pick it up again if nobody wants to take it over. Sorry! Housing Repair Watcher was requested on the WildStar subreddit earlier and I thought I'd give it a shot. This addon will maintain repair timers for plots that you can view across your characters. Additionally, it has options for auto-repairs or displaying alerts when one of your character's plots is closing in on requiring repair. You can toggle the window with /hrw. In order for it to have your character's data you must do this at least once in your housing area otherwise it will simply display no plots. Once it has the data you can open anywhere and on any character on the same account. In order to update the actual repair information from the server, you must be on your housing plot as that information isn't available elsewhere...so visit your house occasionally! - Multiple character support. Any character you log into with your account and use this addon will show up in the character dropdown. 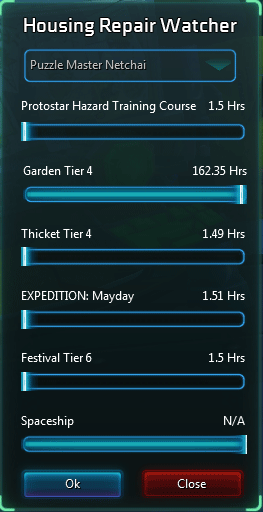 You can view the times for other characters as long as that character has used the addon. - Supports all plot types and displays the necessary information for each. For example, permanent plots don't have a countdown. - Alerts the user when a plot is going to expire even when on other characters. Configuration options now allow you to customize when these alerts happen. You can dismiss an alert by clicking on it. - Auto repair option to automatically repair all expired plots on your land. Only works while you're at your home.